Welcome to Lifeboat Farm, our escape from the city lifestyle to a quieter, more self sufficient existence in the beautiful Wairarapa. 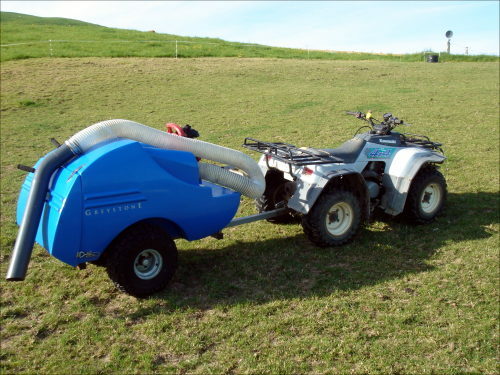 For those wondering “what the heck is a paddock vac for”, well it’s a vacuum for the paddocks – more specifically the manure in the paddocks. This one is powered by a Honda 4 stroke 50cc engine and stores about a half a cubic metre on board. The two main reasons for using it are: we remove the horse manure (and it’s parasites) from the paddock, and I get an unlimited supply of horse manure to compost for the garden. Oh and thirdly, it uses internal combustion so what’s not to like about it? It has an amazing amount of suction and will pick up leaves, sawdust, probably cats as well as manure. Here’s a before and after photo. My only worry is that our more traditional farming neighbours may think us a little odd when they see us vacuuming the paddocks. There’s such a thing as a poo vacuum? OMG I want one! We love using Dreamhost's carbon neutral web hosting. Sign up with them using the link below and they give us some love.